To accommodate the changing needs of full-time photographers always on the road, Booq has released the Boa Flow Graphite, the latest addition to their line of professional camera bags. The redesigned Boa Flow Graphite offers more features than its predecessor, but doesn’t cost much more. This revision of the Boa Flow was especially made for the traveling photographer in mind: it’s lighter, easier to adjust, and contains more compartments to stash your smaller items, like smartphones, wallets, pens, and papers. It provides another level of safety to your gear by utilizing a water-repellent coating combined with a ballistic nylon exterior, giving it the ability to withstand the harshest weather. For added protection, the bag is equipped with a reflective rain cover to make yourself visible to others while in low-light situations. The interior of the bag is flexible, giving the user added storage options. The Boa Flow’s interior is soft and flexible, giving you the option of collapsing either the main or bottom compartments to make room for your equipment. There’s enough space for your DSLR, lenses, mobile devices, and laptop (up to 17 inches). Side zippered pockets add a lot of options for keeping small items safely tucked away; the bag even has a tiny pouch toward the bottom of the strap if you need to grab something on the fly, like an extra battery or memory card. Bring along your favorite headphones and secure it using a strap at the top of the bag’s main compartment. Boa Flow’s back compartment has waterproof zippers to keep your laptop dry, and a soft fabric lining protect it from scratches. There’s an ergonomic strap with three different adjustment points, to let users choose how loose or snug they need it to be. 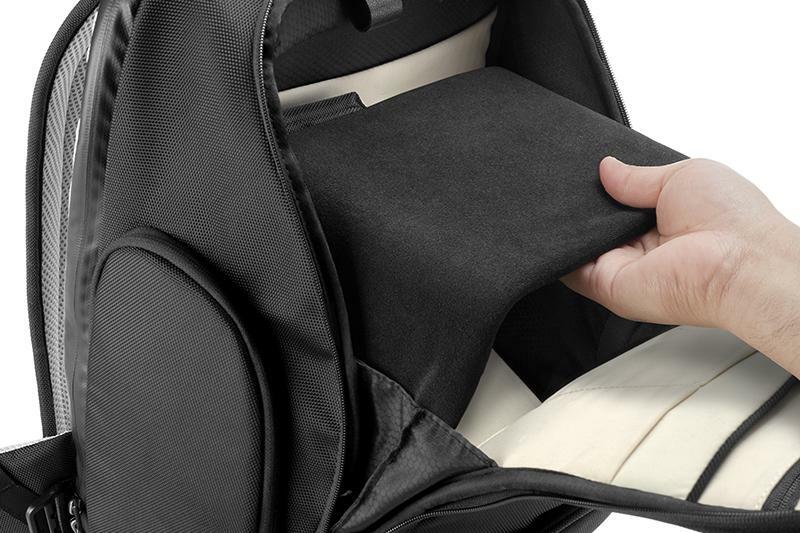 Like other Booq bags, the Boa Flow uses the Terraling system, which consists of a hard tag fitted with a unique serial number that can be used to return your bag to you, should you lose it (if the person who finds it is honest and considerate, that is). The Boa Flow Graphite bag costs $225 and is available via Booq’s website and various U.S. retailers.